This year, companies from all over the world will meet again at the Hannover Messe to discover the latest developments and products. CAD Schroer will be present at this year’s Digital Factory in Hall 6 to showcase its latest industry 4.0 solutions. The Hannover Messe is the world’s leading trade fair for industry. From 1 to 5 April, whether from global corporations or start-ups, 220,000 visitors will meet with 6,500 exhibitors. The fair covers the entire spectrum of industry. IT solutions for design will be on display in Hall 6 in the Digital Factory area, where CAD Schroer will also be presenting its latest solutions and apps for AR, VR, IoT and Factory Design. CAD Schroer will be showcasing innovations in virtual and augmented reality, together with ways to use them in an integrated manner based on IoT concepts. Practical examples will show how these technologies can be easily deployed in industry today. “This year we will show how design data can now be transferred to VR and AR with very little effort,” says Sergej Schachow, Business Development Manager at CAD Schroer GmbH. “These two technologies offer invaluable advantages, which we will present at our stand using practical examples”. CAD Schroer’s software has always enabled companies to design their factories in 3D, but with its latest products, CAD Schroer bridges the gap between engineering and virtual reality. 3D Factory design data can be loaded directly into VR. 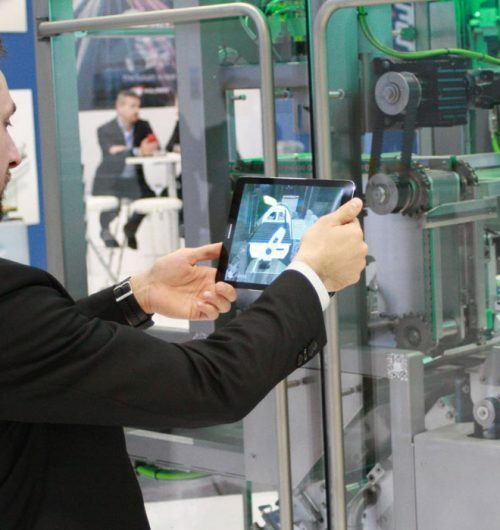 Visitors to the stand will have an opportunity to view and interact with a virtual factory. Several factories are ready and waiting to be experienced in VR.